The JSE Junior Market Index is the index of publicly traded companies below a particular value. For more information check out JSE's website. 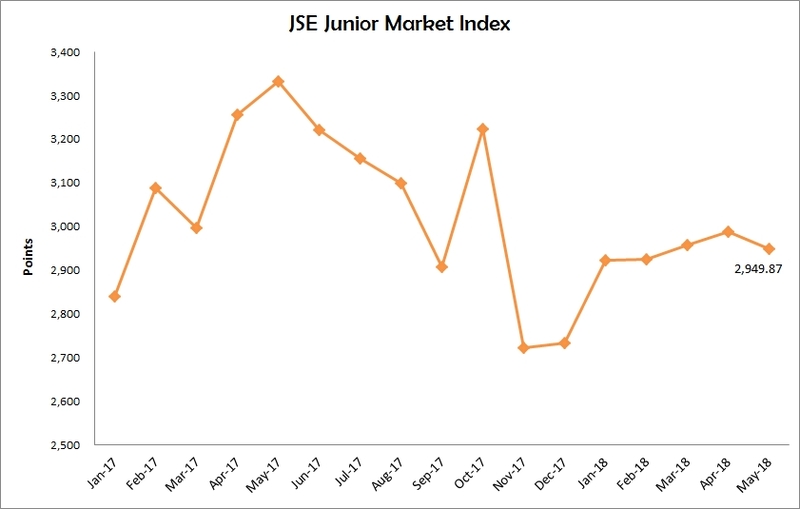 The Image shows the JSE Junior Market Index for the last trading day of each month from January 2017 to May 2018. The Image also shows the trailing 3month average for the Index. Click on the Image to enlarge. The Motion Chart shows the performance of the JSE Junior Market Index for January 2012 to October 2014. Click on the circle that you would like to track on the motion chart before pressing play to begin the animation. This will allow you to track the change over time. Please note the scale on the left hand side of the chart does not start at zero, this helps to magnify the changes in the JSE Junior Market Index for the period.